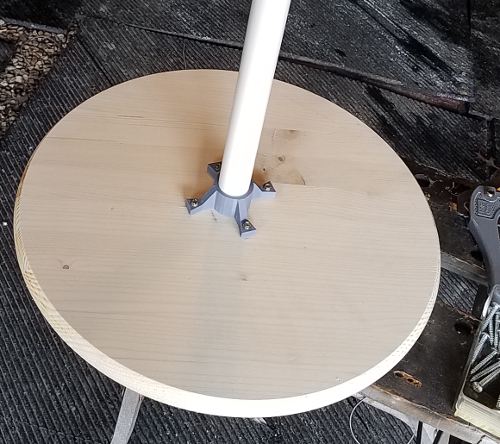 Base: Pre-cut and routered wooden round from Home Depot. Tin foil to cover base, I used heavy duty. (Pineapples will leak, but not horribly) 24" section of 1 inch pvc pipe from Home Depot. 4 Sacrificial Pineapples from Sam's Club. I kept the box for transport. Sacrificial Palm Tree Type Plant. I picked one up from Sam's Club for around $16. 4 sheet metal or wood screws to secure the pipe holder to the base. I believe they were 3/4". 1" Base Support Order from box stores (online only from what I found) or print your own using 3D files below like mine. I covered the base with tin foil to keep as much of the juice off of the base during testing. I cut the core out with a long straight knife. The knife was long enough to go from top to bottom. It was hard, but not impossible. I pushed the cut core from the bottom and then used a fork to pry the core the rest of the way out of the pineapple. I then pushed the cored pineapple over the base to insure that it fit. The pipe did fill up with pineapple guts, so plugged it with a paper towel until finished and then rinsed the pipe out in the sink so it was not covered with juice. Everything was cut the night before the event and kept the cored pineapples in the refrigerator overnight in a 1 gallon ziplock bag. The bag would not close, so I covered them with saran wrap to keep them from drying out. Download X_Stand1v2.zipThe zip file contains the .fpp PowerPrint file, .STL and a .g file for 3D printing. I printed the X-stand with all of the standard settings of my PowerSpec Ultra 3D for PLA using Inland gray PLA. Print time was approximately 60 minutes and uses 6.45 meters of filament. The mount will loosely fit a 1" pvc pipe so I put black electrical tape on the pipe to tighten it some. If you desire it tighter simply shrink the inner wall by 1mm and it should fit snuggly. Screws will depend on the depth of the piece you are attaching it to. I do not believe this will be a real weight bearing unit, but since it's purpose is to hold up a few pineapples it is probably overkill.